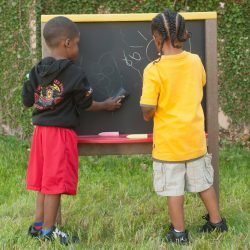 The outdoor Chalk Board provides a drawing and writing surface for two children. Adding outdoor art equipment for playgrounds like the Chalk Board is a great way to provide children with many new opportunities for learning. Children can practice literacy skills as they write a menu for the outdoor kitchen, math skills as they draw shapes, science skills as they draw plants or record the weather, and fine motor skills as they add small details to their drawings. When you are done using this preschool playground equipment, clean the Board off with a regular chalk board eraser, wash it off with wet sponge, or just hose it down. There is a tray at the bottom of the Chalk Board for storing the chalk during play. 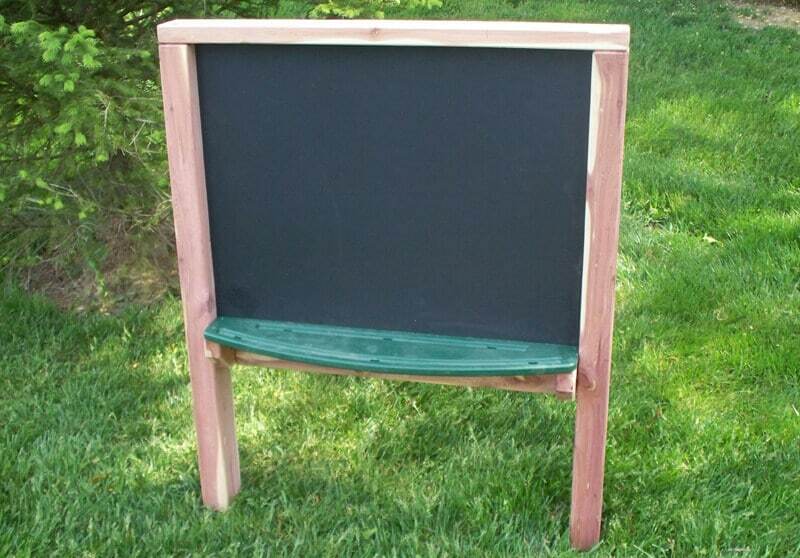 The Chalk Board is available in cedar or maintenance-free plastic. The back side of the Chalk Board is a solid plastic surface with a tray. This area can be used for taping up paper for use as an art easel or the children can draw or write directly on the plastic surface. (Only use washable markers or washable paints). See natural wood product materials. Chalk Board frame is cedar. Tray is made from maintenance-free plastic. • Assembly may be required - easy assembly instructions provided. • Concrete in ground - easy install instructions provided.